Hmmm... but my preference is still the current one after few attempts to add the animated widget, it just couldn't blend into the page. 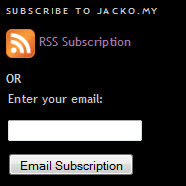 Now anyone can subscribe using email. Any updates will be sent to your email address like any ordinary email. Better huh? One draw back is, if you have many subscriptions on other sites, you drop another email into your inbox.